Discussion in 'Pending Applications' started by Bookwormpower, Mar 23, 2019. Originally from PlanetMinecraft, when I was looking at builds. I saw the King's Landing map in 2015, and had downloaded it and explored that for several IRL months. I didn't know WesterosCraft was a much bigger project until later, and I've been in and out on the server over the past three years or so. Arya! I love her whole arc in the first season, and I named my cat after her lol. Her stubbornness and defiant attitude for much of the first several times the show focused on her was honestly my favourite bit. I also enjoyed how the books portrayed her as growing from a petulant little girl into something more. It's not necessarily to do with building, but I consider myself a proficient writer and I think in the future I'd be helpful with preparing for any RPG/Story-centred content you decide to implement. I tend to see things in my head fairly easily (in terms of what I want to build), but the hard part is getting that out of my head and into a build lol. For one, I've always wanted to learn how to be a better builder when it comes to Minecraft. I love the freedom you can get, especially with the custom items WC provides. I want to help the community, and I think I could be a good addition. In the future, I'd love to help with RP/Story planning (since the FAQ building said that's the end goal)! I think that helping to build the world and be a part of WesterosCraft would give me a reason to look forward to its future, and so that I can stop just flying around with nothing to do xD. - Although you sometimes see those fence support things under the rooves in old builds, my advice is to not do them at all. They don't really make sense, since the whole point of a thatch roof is that the thatch is supposed to be stable and self-supporting. - Avoid making "patchy" vines. The way I usually describe this is that vine blocks should pretty much always have at least one adjacent neighbor. See the image on the left here for an example pattern that satisfies this. Secondly, make sure that each vine pattern connects to soil somehow, as that's how the vines get nutrients. So no floating vines. 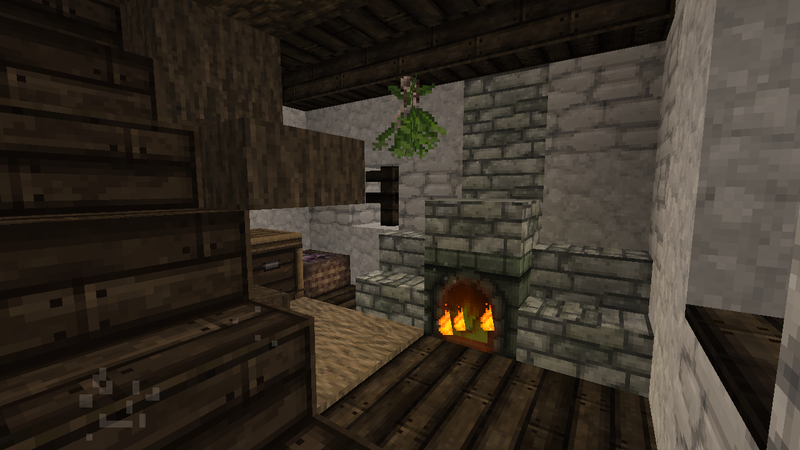 Think of how vines/ivy would actually grow on houses. - Make sure to have a dirt/gravel mix in the garden and for paths around the house where people would frequently walk. - For the interiors as well, never have grass blocks in the floor. Make those dirt/gravel (or stone or wood, depending on the style). - Use the other vertical rope block (the one without the harness thing) for the hanging bunny, since the harness one doesn't connect with the texture. Other than those things, you're off to a great start! For the first challenge build, please make a medium-sized house in the style of /warp woodwright. Feel free to ask if you have any questions or want any advice. Good luck! 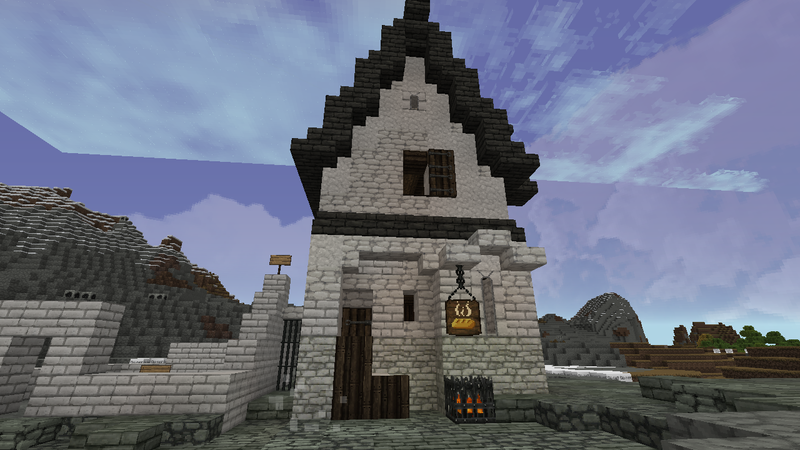 Here's the next house, inspired by the requested town. I tried to go for a more herbalist lady kinda thing. Wilshire71 and AerioOndos like this. Great work, you've gotten down most of the important elements of Woodwright! I just have some more picky feedback this time, you're catching on very quickly. - The house exteriors are well done, I don't really have any feedback there except for one small thing: you should use stairs or wall blocks on the chimney here so it doesn't just have that flat ledge in the middle. - A couple notes regarding the yard. First, you always want to avoid so-called "bubble yards", which is when the wall of the yard seems blob-like and not well defined relative to the house. You pretty much always want to use straight lines (can be diagonal) and corners. I recommend you take another look at Woodwright and see how this is done. Second, don't just use random flower/plant types together, make sure there's consistency. Also, yards would typically serve practical purposes rather than just growing pretty flowers, so they'd have veggies or herbs there. - Whenever you have a slate roof, it always needs to be covered up and supported on the inside to the best of your ability, since slate tile is heavy. Other than those fairly minor things, you've done a great job. So for the next challenge build, let's head up to the North: please make a middle-class house in the style of /warp whiteharbor. The middle-class ones can generally be found to the southwest part of the city. As before, feel free to ask if you have any questions on the feedback or WH style. Good luck! - By "two homes in one building", I'm assuming you mean like a tenement type house? That's perfectly fine, we do it all the time in city builds. One thing that's nice to do, if you have the room, is to add an exterior stairs for these types of houses. - The gradient isn't bad, but could also be a bit better. You generally want to start by making the whole thing out of a "primary" block (in this case, white harbor cobble), and then adding continuous blobs of some secondary block (such as the white plaster) here and there to represent corrosion. /warp gradient has a nice tutorial of this kind of gradient on the right. It mostly just takes practice though, WH has a particularly tricky gradient to get right. - I'm not sure about the stone extrusion above the profession sign here, I'd probably go for something more subtle. - I'd go for a simpler design for the furnace here, without the two stair blocks on either side. 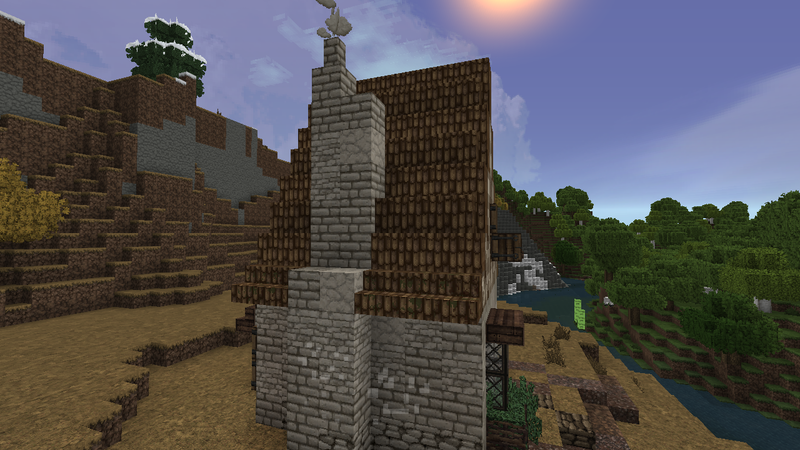 Also, I'd suggest using small stone brick for the chimney, as it's the same color as the furnace block. - I wouldn't recommend mixing oak log and spruce wood in the rafters, the oak/spruce combo always contrasts a bit too much. Oak+jungle, spruce+jungle, jungle+northern wood, etc. are all better combinations. Other than those things, very solid job! For the next challenge build, please make a middle-class house in the style of /warp fairmarket. The style there is a little more complex, so make sure to take your time, although I'm sure you won't have any major troubles with it. Feel free to ask if you have any questions about the feedback or challenge build. Good luck!